When Aragorn and his hobbit charges were hunted through the wilds of Eriador by Sauron's Ringwraiths. the Elf princess Arwen seized sword and saddle. and rode from Rivendell to meet him. In the Trollshaw Forest Arwen found her love. but the Wraiths were close. Hobbit Frodo Baggins had been stabbed by a Morgul blade. and even now its shard worked its way ever closer to his heart. On foot they had no chance. but holding Frodo to her. 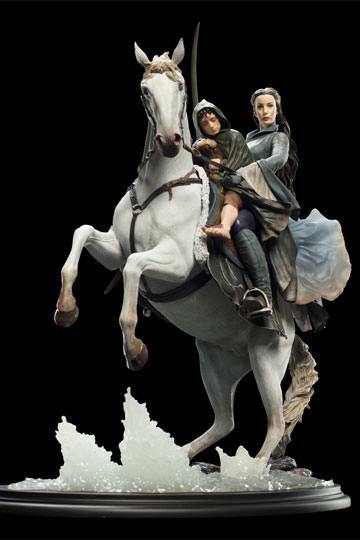 Arwen spurred her valiant mount Asfaloth into the sprint of his life. With the Nine Nazgûl at their heels. Arwen and Frodo rode alone for the Ford of Bruinen. where she hoped the enchanted waters of her father's home might protect them from their pursuers. Sculpted by the masterful Jane Wenley. Arwen and Frodo on Asfaloth joins Weta Workshop's high-quality 1:6 scale Middle-earth line; a line that is made by the very same artists and technicians who work on our movies.